Another fun addition to our line of coconut toys! We didn't want the smaller birds to feel left out so we made a smaller version for most of the smaller to mid-sized parrots to enjoy. 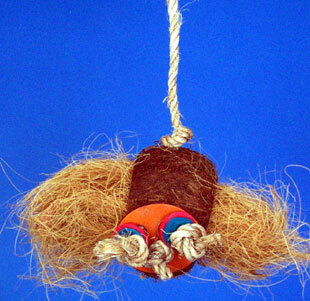 The "head" of Kiki Koala is a whole coconut, including hair, that has been cleaned and has holes on both ends which has been filled with sterilized coconut fiber. The face is a large colorful coconut shell with smaller oyster shell washers for the eyes and tied with natural fiber, hand made sisal cord, with a sisal button nose! There's even a natural coconut hook for easy hanging in your parrot's house! When the fiber has been removed from the coconut, you can hide goodies inside to make a neat foraging toy! This is a natural coconut so the sizes will vary, approximately 4", 6" diameter coconuts. 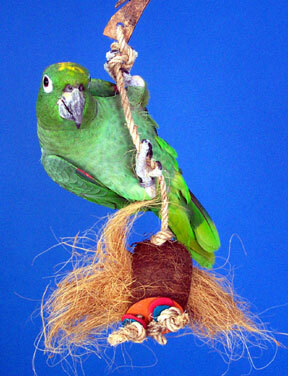 Sumo, the mealy Amazon, loves the texture of the natural cord and the coco fiber! Please note: this is handmade with natural coconut so colors and sizes will vary!